Dissolution of marriage. The origin of the Jewish law of divorce is found in the constitution of the patriarchal family. The fundamental principle of its government was the absolute authority of the oldest male ascendent; hence the husband, as the head of the family, divorced the wife at his pleasure. The manner in which Hagar was dismissed by Abraham illustrates the exercise of this authority (Gen. xxi. 9-14). This ancient right of the husband to divorce his wife at his pleasure is the central thought in the entire system of Jewish divorce law. 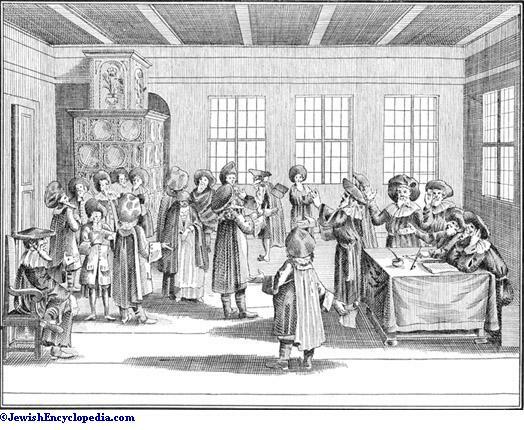 It was not set aside by the Rabbis, though its severity was tempered by numerous restrictive measures. It was not until the eleventh century that the absolute right of the husband to divorce his wife at will was formally abolished. 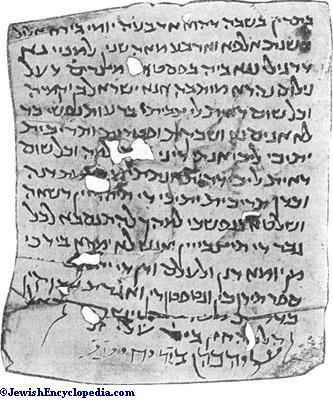 Hebrew Bill of Divorce, or Get, from the Cairo Genizah, Dated 1400 Seleucid Era = 1088 C.E. The earliest restrictions of this right are found in the Deuteronomic code. In two cases the law provided that the husband "shall not be at liberty to put her away all his days": (1) if he falsely accused her of antenuptial incontinence (Deut. xxii. 13-19); (2) if he had ravished her before marriage (Deut. xxii. 28, 29). In the Mishnaic period the theory of the law that the husband could divorce his wife at will was challenged by the school of Shammai. It interpreted the text of Deut. xxiv. 1 in such amanner as to reach the conclusion that the husband could not divorce his wife except for cause, and that the cause must be sexual immorality (Git. ix. 10; Yer. Soṭah i. 1, 16b). The school of Hillel, however, held that the husband need not assign any reason whatever; that any act on her part which displeased him entitled him to give her a bill of divorce (Giṭ. ib.). The opinion of the school of Hillel prevailed. Philo of Alexandria ("Of Special Laws Relating to Adultery," etc., ch. v.; English ed., ii. 310, 311) and Josephus ("Ant." iv. 8) held this opinion. Jesus seems to have held the view of the school of Shammai (Matt. xix. 3-9). Although not overthrown, the ancient theory of the husband's unrestricted right was still further modified by the Mishnah. 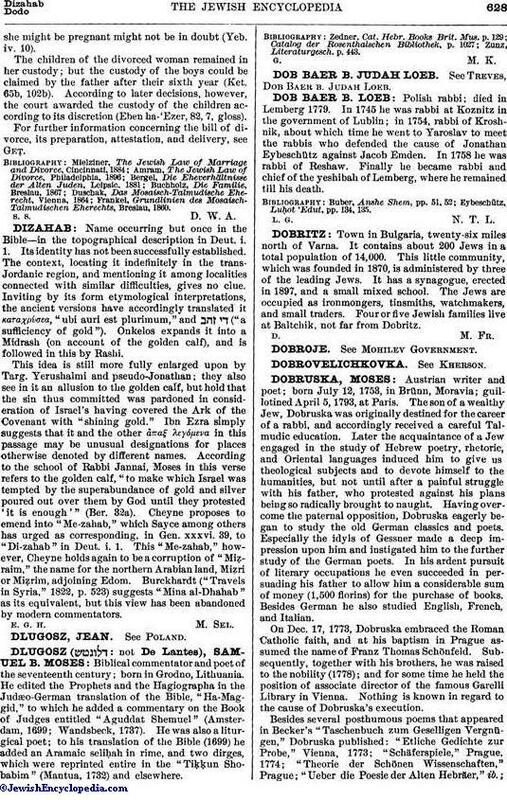 To the two restrictions mentioned in Deuteronomy the Mishnah, adds three others. It provides that the husband can not divorce his wife, (1) when she is insane (Yeb.xiv. 1), (2) when she is in captivity (Ket. iv. 9), or (3) when she is a minor, so young as to be unable to understand or to take care of her get, or bill of divorce (ib.). 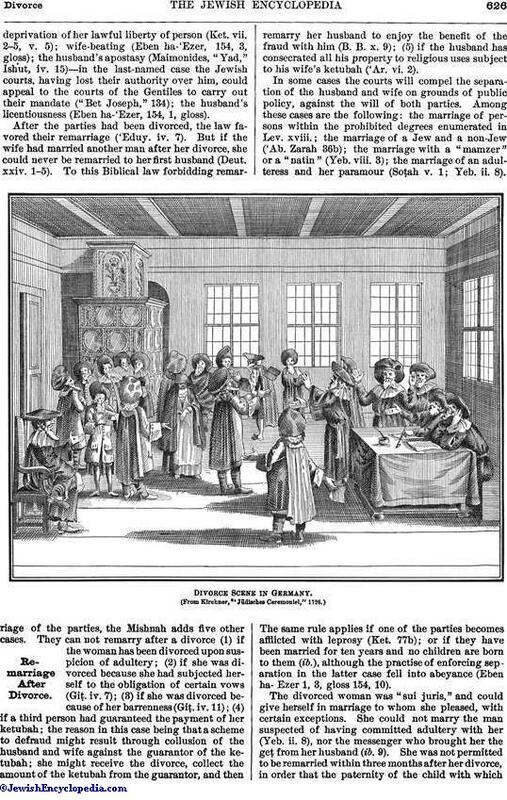 The Mishnah furthermore modified the right of the husband indirectly by making the divorce procedure difficult, and bristling with formalities in ordering, writing, attesting, and delivering the get. The matter required the assistance of one learned in the law (Ḳid. 6a), whose duty it became to attempt to reconcile the parties, unless sufficient reason appeared for the divorce. Another check on the exercise of the theoretical right of the husband to divorce his wife was the law compelling him to pay her the dowry or the amount of her Ketubah. Rabban Gamaliel deprived the husband of the power to "annul" his geṭ (see Cancelation of Documents) (Giṭ. iv. 2). If the husband was insane, he could not divorce his wife; and if he was temporarily deranged or delirious, or intoxicated, he was for the time being incapable of performing this as well as other legal acts (Yeb. xiv. 1; Giṭ. vii. 1, 67b). A deaf-mute could not divorce his wife unless he had married her after he had become a deaf-mute (Yeb. xiv. 1). These many qualifications of the theoretical right of the husband to give a geṭ to his wife at his pleasure, resulted in gradually eliminating from the popular mind the notion that such a right existed. The views of the moralists were opposed to divorce (Giṭ. 90b), and finally (as stated above), in the eleventh century, by a decree of Rabbi Gershon of Mayence, this theoretical right of the husband was formally declared to be at an end. The substance of this famous decree is thus stated (Responsa "Asheri," xlii. 1): "To assimilate the right of the woman to the right of the man, it is decreed that even as the man does not put away his wife except of his own free will, so shall the woman not be put away except by her own consent." Where either of the parties, however, shows good cause for divorce the marriage will be dissolved against the will of the guilty party (Shulḥan 'Aruk, Eben ha-'Ezer, 119, 6, gloss). 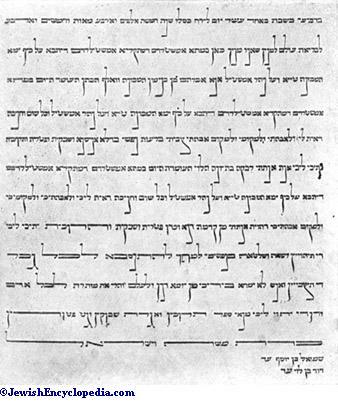 Hebrew Bill of Divorce, or Geṭ. The wife's right to sue for divorce was unknown to the Biblical law. There is a germ of this right in Ex. xxi. 11, but it was not until the Mishnah that this right was established. The wife never obtained the right to give her husband a geṭ, but when the court decided that she was entitled to be divorced from him, he was forced to give her a geṭ. 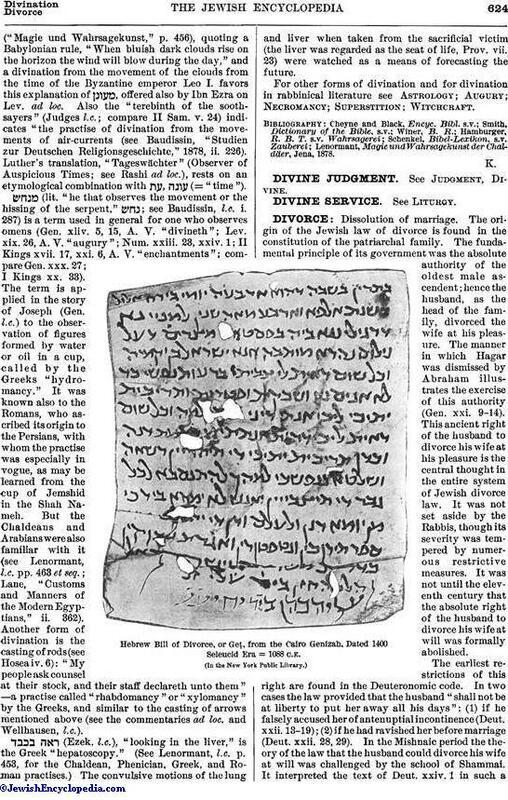 During the reign of the Herodians, under the influence of Roman practise, cases are recorded in which women sent bills of divorce to their husbands (Josephus, "Ant." xv. 11, xviii. 7). These were recognized as breaches of the law, and never became precedents. The following causes are recognized as entitling the wife to demand a bill of divorce from her husband: refusal of conjugal rights (Ket. v. 6); impotence (Ned. xi. 12); when the husband has some loathsome disease, or leprosy, or is engaged in some malodorous business (Ket. vii. 9); the husband's refusal to support her (Ket. 77a); cruel treatment anddeprivation of her lawful liberty of person (Ket. vii. 2-5, v. 5); wife-beating (Eben ha-'Ezer, 154, 3, gloss); the husband's apostasy (Maimonides, "Yad," Ishut, iv. 15)—in the last-named case the Jewish courts, having lost their authority over him, could appeal to the courts of the Gentiles to carry out their mandate ("Bet Joseph," 134); the husband's licentiousness (Eben ha-'Ezer, 154, 1, gloss). After the parties had been divorced, the law favored their remarriage ('Eduy. iv. 7). But if the wife had married another man after her divorce, she could never be remarried to her first husband (Deut. xxiv. 1-5). To this Biblical law forbidding remarriage of the parties, the Mishnah adds five other cases. They can not remarry after a divorce (1) if the woman has been divorced upon suspicion of adultery; (2) if she was divorced because she had subjected herself to the obligation of certain vows (Giṭ. iv. 7); (3) if she was divorced because of her barrenness (Giṭ. iv. 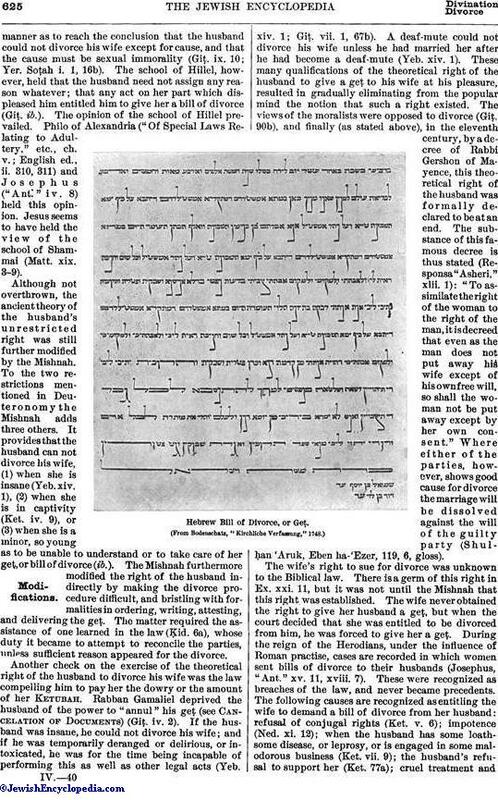 11); (4) if a third person had guaranteed the payment of her ketubah; the reason in this case being that a scheme to defraud might result through collusion of the husband and wife against the guarantor of the ketubah; she might receive the divorce, collect the amount of the ketubah from the guarantor, and then remarry her husband to enjoy the benefit of the fraud with him (B. B. x. 9); (5) if the husband has consecrated all his property to religious uses subject to his wife's ketubah ('Ar. vi. 2). In some cases the courts will compel the separation of the husband and wife on grounds of public policy, against the will of both parties. Among these cases are the following: the marriage of persons within the prohibited degrees enumerated in Lev. xviii. 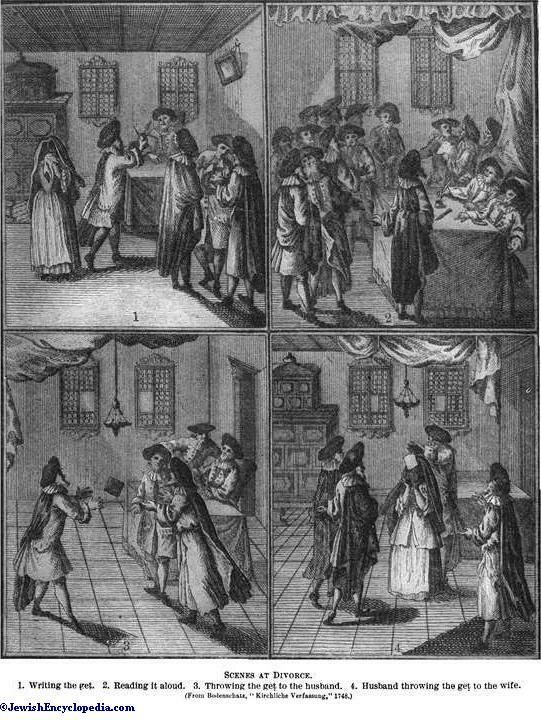 ; the marriage of a Jew and a non-Jew ('Ab. Zarah 36b); the marriage with a "mamzer" or a "natin" (Yeb. viii. 3); the marriage of an adulteress and her paramour (Soṭah v. 1; Yeb. ii. 8). The same rule applies if one of the parties becomes afflicted with leprosy (Ket. 77b); or if they have been married for ten years and no children are born to them (ib. ), although the practise of enforcing separation in the latter case fell into abeyance (Eben ha-'Ezer 1, 3, gloss 154, 10). Scenes at Divorce.1. Writing the get. 2. Reading it aloud. 3. Throwing the geṭ to the husband. 4. Husband throwing the geṭ to the wife. 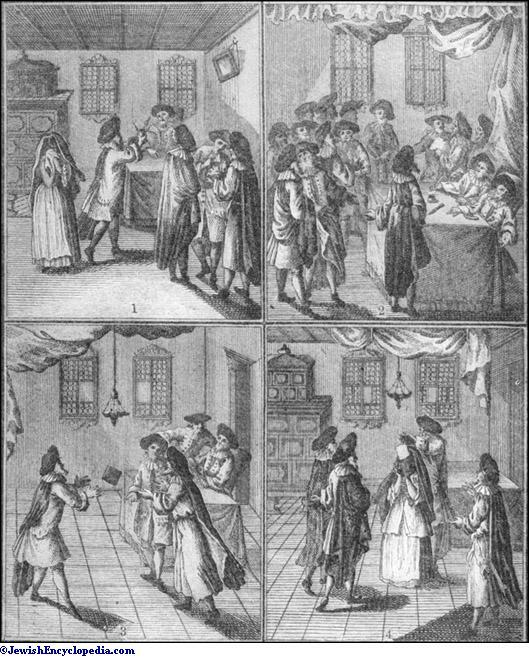 The divorced woman was "sui juris," and could give herself in marriage to whom she pleased, with certain exceptions. She could not marry the man suspected of having committed adultery with her (Yeb. ii. 8), nor the messenger who brought her the geṭ from her husband (ib. 9). She was not permitted to be remarried within three months after her divorce, in order that the paternity of the child with which she might be pregnant might not be in doubt (Yeb. iv. 10). The children of the divorced woman remained in her custody; but the custody of the boys could be claimed by the father after their sixth year (Ket. 65b, 102b). According to later decisions, however, the court awarded the custody of the children according to its discretion (Eben ha-'Ezer, 82, 7, gloss). For further information concerning the bill of divorce, its preparation, attestation, and delivery, see GeṬ. Frankel, Grundlinien des Mosaisch-Talmudischen Ehercchts, Breslau, 1860. S. S. D. W. A.